I got all the patterns I wanted at the sale. 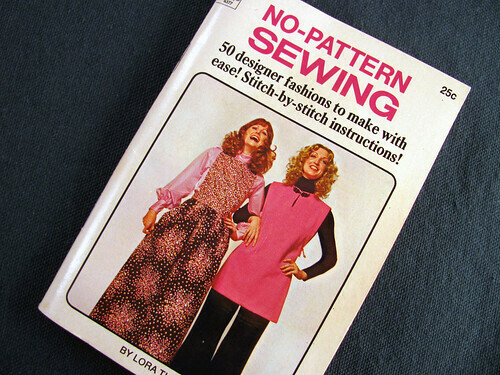 Putting them away and looking through my other patterns, I found this little book I bought as a teenager. I love it, 50 designer fashions to make for 25 cents. That is only a 1/2 cent a fashion. It is one of those little 3″x5″ paperbacks that were commonly sold at the grocery store checkouts. The designs are really basic. I have seen several books published lately that have similar information for much more money. I showed the booklet to my son and he commented on the illustrations. That may have been why I bought the book. I drew lots of girls in this style in high school. I use to copy fashion illustrations for fun. The cloche hat and shawl are in fashion now. 1925, 1965, 2005, seems they are back in style about every forty years. 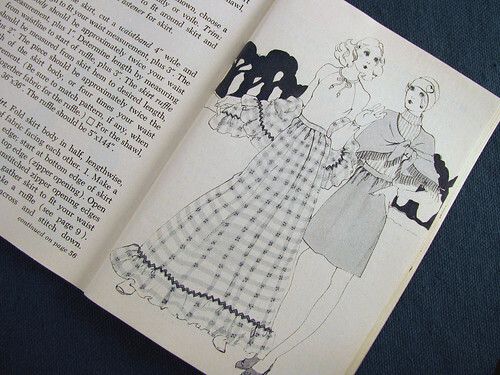 Looking through the pattern catalogs today I saw several patterns similar to the dress on the right below. 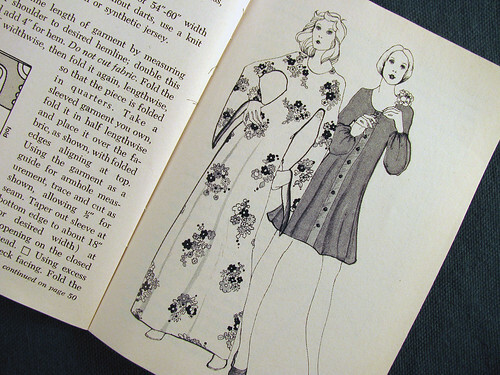 Every design featured in this little booklet had a maxi and mini version. The book was published in 1972. In 1972 maxi’s were so last year. I remember the year well. I started high school and girls could finally wear pants to school. That pretty much did away with the mini too. This entry was posted on Friday, January 30th, 2009 at 3:00 am and is filed under Sewing. Tagged: Book, Clothing, Sewing, Shawl. You can feed this entry. You can leave a response, or trackback from your own site.